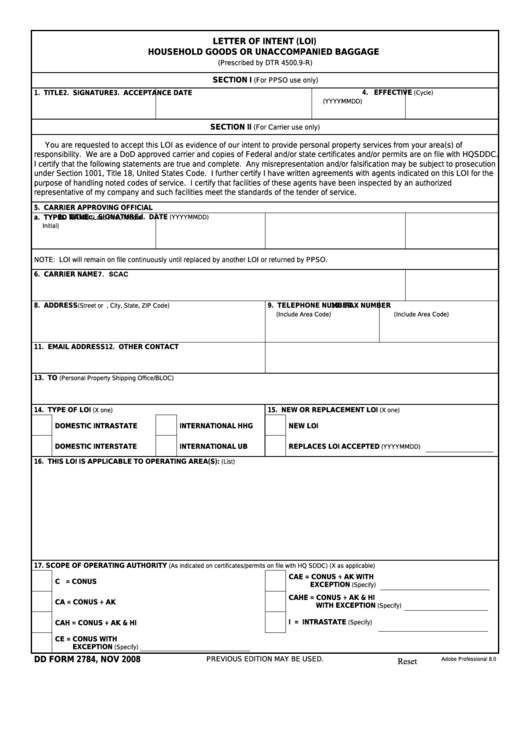 Download a blank fillable Dd Form 2784 - Letter Of Intent (Loi) Household Goods Or Unaccompanied Baggage in PDF format just by clicking the "DOWNLOAD PDF" button. Complete Dd Form 2784 - Letter Of Intent (Loi) Household Goods Or Unaccompanied Baggage with your personal data - all interactive fields are highlighted in places where you should type, access drop-down lists or select multiple-choice options. responsibility. We are a DoD approved carrier and copies of Federal and/or state certificates and/or permits are on file with HQ SDDC. representative of my company and such facilities meet the standards of the tender of service. NOTE: LOI will remain on file continuously until replaced by another LOI or returned by PPSO.